Thick, silky and with that unmistakable crust, Rodda’s Cornish clotted cream is something that’s been centuries in the making. Discover the story of how this simple farmhouse tradition rose to the top. Whether you’re the kind of person who enjoys afternoon tea or not, it’s highly likely you’ve indulged in a scone or two in your time. On that scone you no doubt spread jam (probably strawberry or raspberry) and finished it off with a nice big dollop of cream. But this would have been no ordinary cream. Super thick, rich and incredibly indulgent, Cornish clotted cream has been delighting people in the South West since 500BC, when it’s thought Phoenician traders swapped the recipe for valuable Cornish tin. For such an iconic product, clotted cream is a pretty simple thing to make. Cream is gently baked in an oven, allowing the richest, most flavourful part to slowly rise to the top and turn into a firm golden crust. Not only does this add a bit of texture, it also seals in the freshness of the cream below. However, this ancient process has been an essential part of Cornwall’s rich food scene for centuries. We all have memories of either visiting the South West and trying Cornish clotted cream for the first time or discovering its incredible flavour and texture elsewhere in the UK, and the fact that it’s become arguably one of the most iconic foods of Britain is testament to what an historic, memorable and (most importantly) tasty thing Cornish clotted cream is. The most famous clotted cream producer in the world is Rodda’s, a company that’s been going since 1890. Still owned by the Rodda family (Nicholas Rodda is the fifth generation owner of the business), Rodda’s Cornish clotted cream is produced on the same site in Redruth as it was back in the nineteenth century, made using local milk to the same recipe. It’s this local milk that Nicholas says is the secret to creating the yellow, golden crust; the cows graze on Cornish grass with a particularly high amount of beta-carotene in (the stuff that makes vegetables like carrots orange) which in turn affects the quality and colour of the milk. Cornish clotted cream obviously holds incredibly close ties to the county, but Rodda’s is going the extra mile to make sure the farmers it sources its milk from get a good deal. The producer will soon be buying its milk direct from farmers in west Cornwall, ensuring more stable pricing and rewards paid for milk quality. 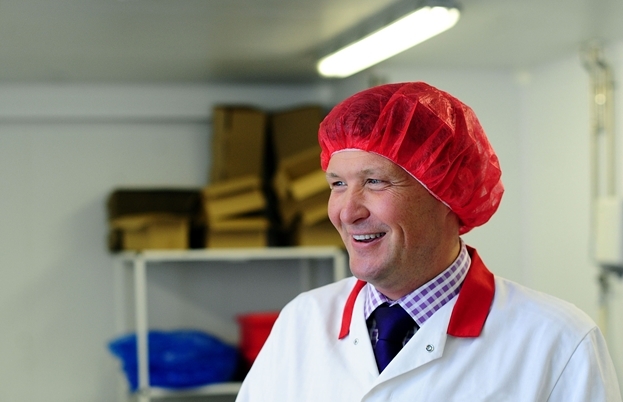 Rodda’s isn’t just known for producing clotted cream; it’s also been the driving force behind its popularity across the world. Traditionally the product wouldn’t last more than a couple of days, which meant it rarely made its way out of the farmhouses and local Cornish communities where it was produced. But by sterilising glass jars in which to pack the cream, Rodda’s was able to sell a product which would travel well and last longer. It is now exported to countries as far away as Singapore and Malaysia. It’s even served on the majority of flights departing from Heathrow, so tourists can enjoy a taste of quintessential Britain as they return home. However, with the rise in popularity of clotted cream outside of Cornwall, the Rodda family was worried that their precious product was at risk of losing its authentic heritage. That’s why in 1993 the company sent an application to the EU asking for traditional Cornish clotted cream to be granted PDO protected status. After five years of hard work it was accepted, ensuring the future of traditional Cornish clotted cream and guaranteeing its authenticity all over the world. These days if you see something advertised as Cornish clotted cream, it must be made in Cornwall with Cornish milk, adhering to a traditional Cornish recipe. 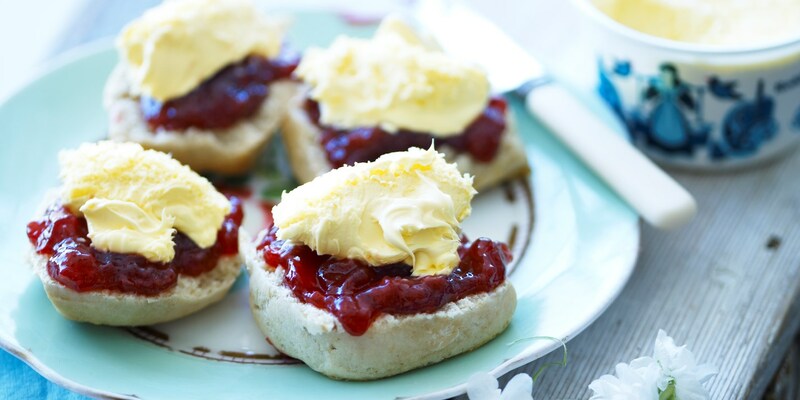 There’s no denying that Cornish clotted cream is a vital part of any cream tea (working particularly well in Anna Hansen’s version), but it can be used in all sorts of other dishes – both hot and cold – to great effect. Cornish clotted cream ice cream is a great way to prolong its life even further, giving an already indulgent dessert even more flavour and richness. Use it to make Clotted cream fudge or serve it dolloped on top of Indian desserts for something different. You can even use it in a savoury context; stirred through mash or used to enrich sauces, clotted cream is a quick and easy way to amp up the rich, indulgent aspect of any recipe. However, as a nation, one of our favourite ways of serving it, especially in the run-up to Christmas, is with mince pies. 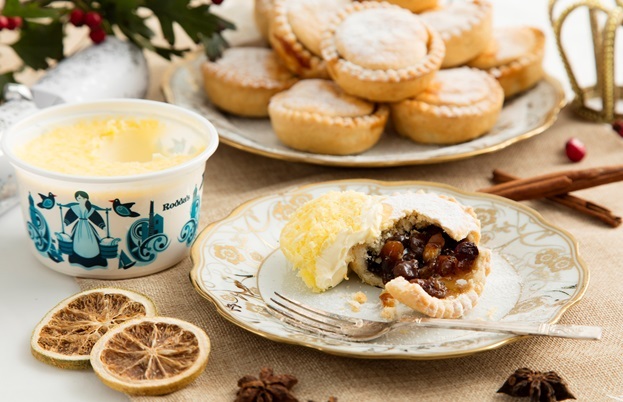 The silky cream complements the sweet, spiced mincemeat perfectly, which is why Rodda’s makes more of the stuff throughout the festive period than during any other time of year. In Cornwall it’s the done thing to gently prise open a warm mince pie, spoon clotted cream inside and seal it back up. There’s also been a surge in foodies replacing the traditional brandy butter for their Christmas puddings with Cornish clotted cream, letting it slowly melt and ooze over the top. These new ways of using clotted cream might not have as much history behind them as the traditional cream tea, but we wouldn’t be surprised if this Cornish secret becomes just as popular for Christmases to come.